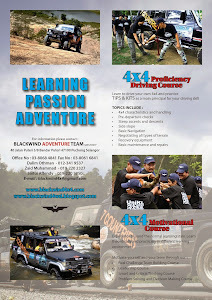 BAT aka Blackwind Adventure Team have organized another trip but this times a fishing trip to one of the undiscovered Malaysian Tropical Rainforest, BELUM FOREST. The team consist of 5 units 4x4 Mitsubishi Pajero and 15 passenger. We left Shah Alam city on the midnight in hope to reach the Grik town at 6 am in the morning. It will take us about 4 hours using the main North South PLUS highway to reach Grik town. We will accompanied with 2 local peoples as our guide. We arrived at Grik town at approximately 6 am and after having our breakfast, shopping for our 4 days 3 night daily necessities and fill up our 4x4s, the journey continue and it will take us about 3 to 4 hours to reach the camp site. We will using the the timber tracks and have to be very be careful when meeting the timber trucks as the area is an active logging area. 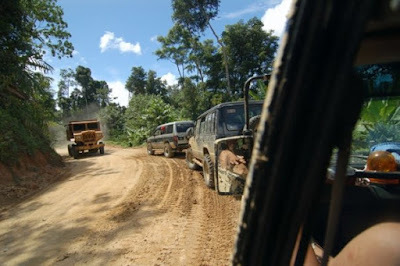 Although I am not really agree to the logging activities but it have provide us a track to our destination. 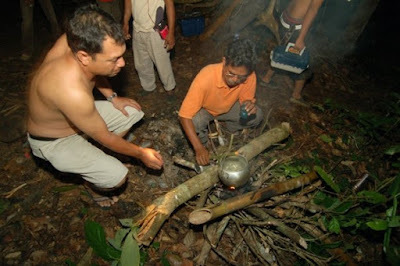 Hutan Belum is reported to cover an area of 290, 000 hectares. 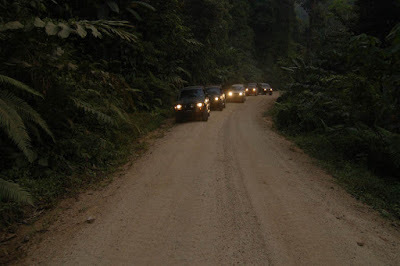 Belum forest is divided into North and South. Part of the forest is not covered by the 117, 500 hectares of thick forest and entered the Thailand-Malaysia border. Vast areas of forest can be regarded as a natural wall and the "Gazette" as a preserved tropical rain forest by Malaysia government. Part of the forest is 90% that has not yet been explored and it is a vast area for research. It is compulsory for us to get an Entry Permit from Grik, Wildlife Department to enter the Belum Forest. At the entrance point, the team will undergo the thorough checking to ensure there are no restricted items be brought into the forest. The hot weather has resulted the timber track become very dusty. Before we reach to the camp site, we have been told that our 4x4 have to descend 60 degree down and it will be very dangerous when come to rainy day as the road become very slippery. However, we managed to overcome the obstacles and the team arrived at the camp site at very late evening and we have to set our tent and camping gear with help of our car light. 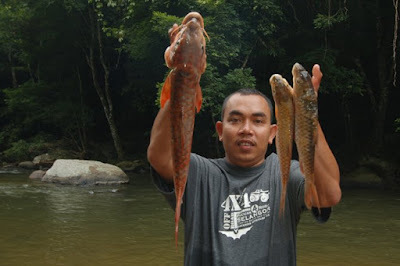 We spent 3 days 2 nights camping while fishing and exploring the nature. 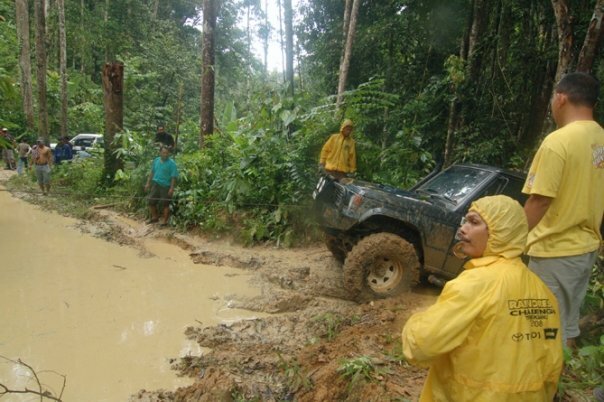 However, during the days we were there, the rain has pouring the jungle which has impeded our activities. On the early morning of day 3 we decided to pack and make our trip home with the hope that the track won't be so slippery as we have to ascend 60 degree up, if not it will become a very tough ride for us. However, what we worry about is really happening when the track to climb become very slippery and very dangerous. 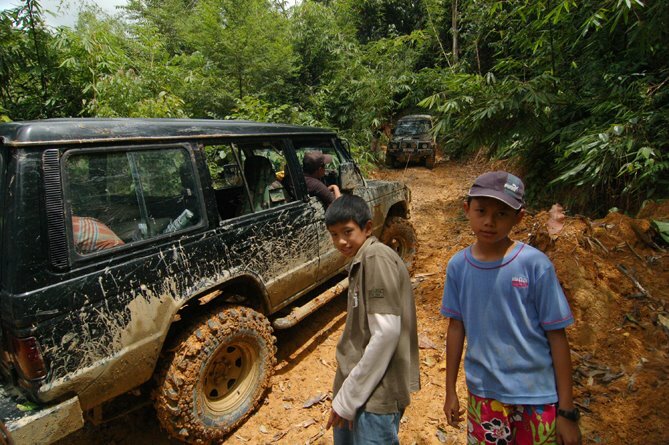 We have no choice but to continue the journey home by climbing up and it has caused my 4x4 ran out of plate clutch. My 4x4 have to be winched and towed back to Grik. I and my two sons have decided to stay another night at Grik in order for us to repair my 4x4 on the next day. It have become an amazing journey for me and my kids and we hope to return back soon. That was my first time experienced the major broke down with my 4x4. Before that the vehicles was running without any major problem.